They think it is their yard. We were lunch eating on the deck, and there were two deer to the East and two deer to the West. They just go about munching like we don't exist. 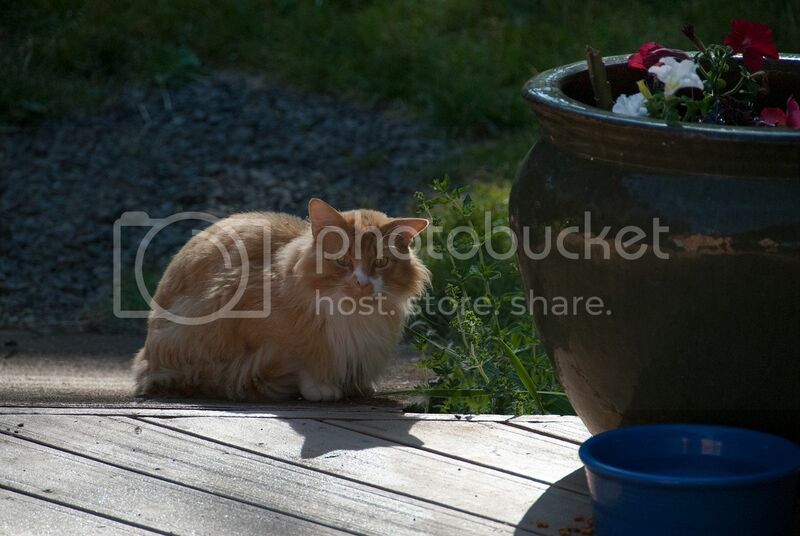 I came out yesterday morning and these two were looking at the deck, the stray cat was on the deck. The stray cat they were so interested in. Re: They think it is their yard. Nice pictures! 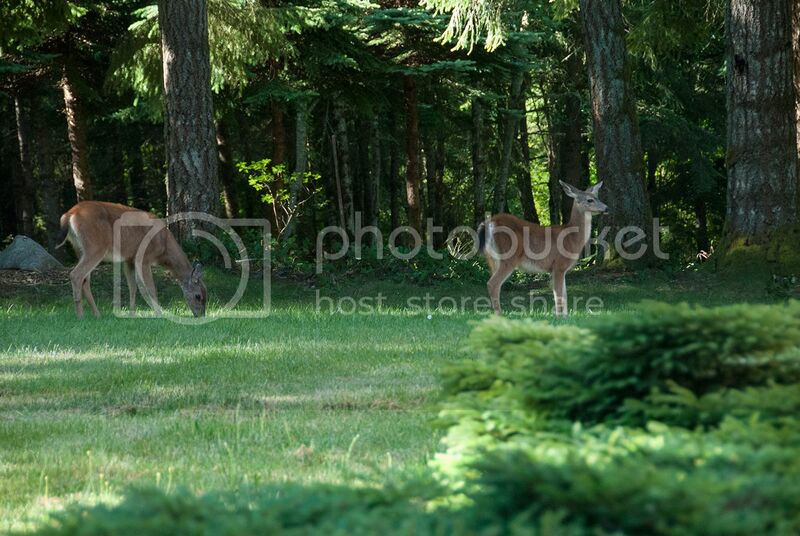 I was talking to my next door neighbor the other day & she said she saw two deer in her yard recently. I haven't seen them in my yard, but the back/bottom half of my yard is so wooded, they could be there & I wouldn't know it. With plenty of deer here along the Missouri River where we live, a deer fence eight feet tall had to be put up around the vegetable garden. No such luck with all the flower beds. 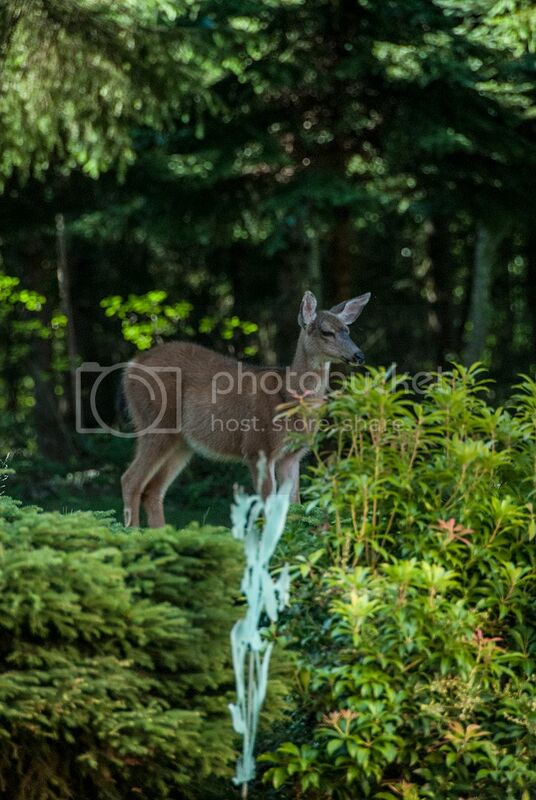 The darned deer just decide what is for dessert every night and snack on the flowers. It isn't like they don't have a couple hundred acres of vegetation within walking distance. Rabbits I shoot, raccoons I try to shoo away by popping them with a pellet gun, the squirrels have plenty to eat and don't bother the gardens, opossums and ground hogs pretty much leave us alone I think because the coyotes and bobcats like to snack on them. The wild turkeys love the excess acorns and walnuts and that helps me keep the yard cleaned up. Foxes keep the rodent population down and snakes help out with that. Every once in a while we hear about a mountain lion or two roaming around. No evidence of that yet around our yard. Deer and raccoons love to eat the fruit; peaches, apples and pears. I have not figured out how to keep them away from that. I would love to eliminate both pests, but that is not only nearly impossible but also against the law as well. Nature's majestic pageantry. But I hear black bears are making their way north from southern Missouri. Now that would be scary. My blackberries are not big enough yet. I put a deer fence around our garden also, I have not seen turkeys here or fox but the rest I have. The criters think things are put there for them to eat, so i try to get plants they do not like. Sometimes they eat them any way. Deer are rare enough for us that anyone who sees them calls out "Deer!" and DH or I -- driving -- would at the vey least let up the accelerator so everyone (not driving) can look around and see them. So, seeing doe and fawns like that would seem idyllic to us. My SIL has some acreage on a lake, half of it is wooded. They had a doe wander into their yard one day, so they started throwing out cracked corn for her. She chased the squirrels away from it. Then one day she brought out a fawn. The next year they had two does, and one brought out two fawns. They were both bucks. One died, BIL found the body near the lake. The other is starting to grow antlers. It's been awesome to watch them grow. We see them most of the time we go up there. They'll mosey around the yard and munch the corn. Don't pay too much attention to anything but the dog. applestar wrote: Deer are rare enough for us that anyone who sees them calls out "Deer!" and DH or I -- driving -- would at the vey least let up the accelerator so everyone (not driving) can look around and see them. Until they started eating your tomatoes! Where I lived before we had deer around all the time. I would be watching tomato fruits grow and get close to blushing and then the next day it would just be gone, no trace that it was ever there. One of those summers I hardly got to eat a single tomato. 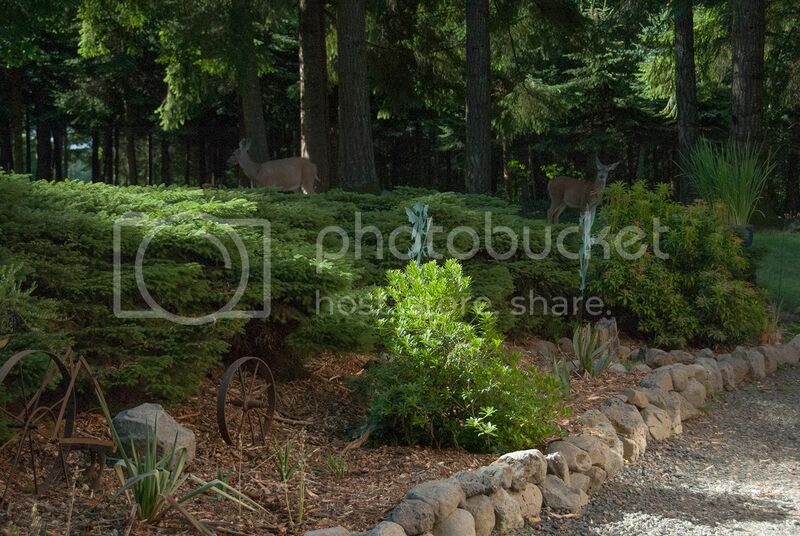 I have to have a deer fence around my vege garden. Yesterday I was walking and two grouse flew up in front of me, they scared me almost as much as I scared them. 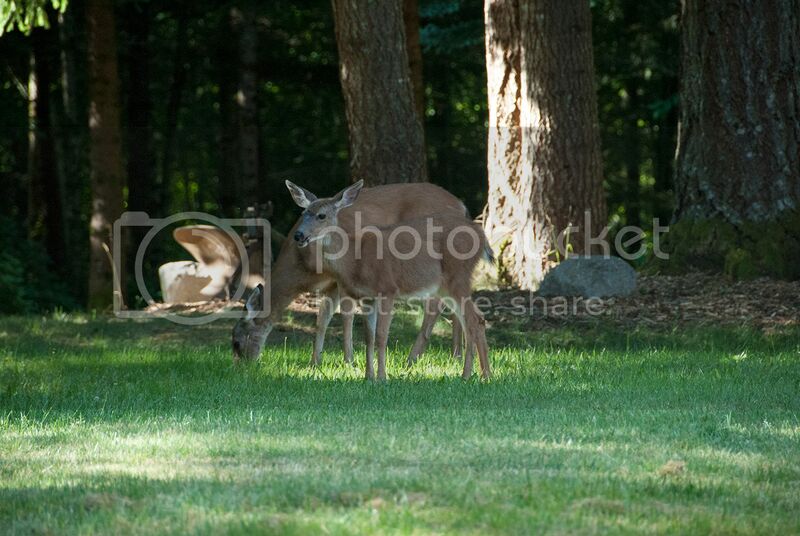 One of the deer in the yard. Best birds for your yard?? ?